These spider cookies are an easy fun treat for kids for Halloween. Let your kids get in on the fun and let them help decorate them! Beat shortening, peanut butter, brown sugar, sugar, together. Beat in egg, milk, and vanilla extract. Stir in flour, baking soda, and salt. Form dough into 1-inch balls and place on greased cookie sheet. Bake at 375 degrees for 10-12 minutes, or until just starting to brown. Decorate these spider cookies while they are still warm. Use Whoppers or Milk Duds for the spider bodies. You can use one or two candies for the body, whichever you like the look of better. If you place the candies on the cookies while the cookies are warm, the candies will melt slightly, and then harden again. This will keep them from falling off the cookies. Just make sure not to disturb them while they are hardening. 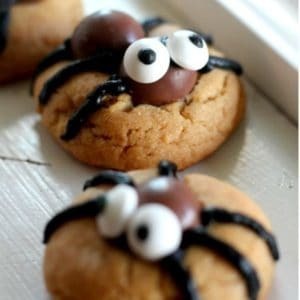 Use a tube of black decorator frosting to place the candy eyes on the spiders. Place a small dot of frosting on the body to hold the eyes in place. Use the tube of frosting to draw the legs on the spiders. These cookies would freeze well if you need to make them ahead of time. Just make sure all of the icing is hardened before you put them in the freezer. Freeze these cookies in a single layer in gallon size ziploc bags and remove from freezer and hour or two before you need them. 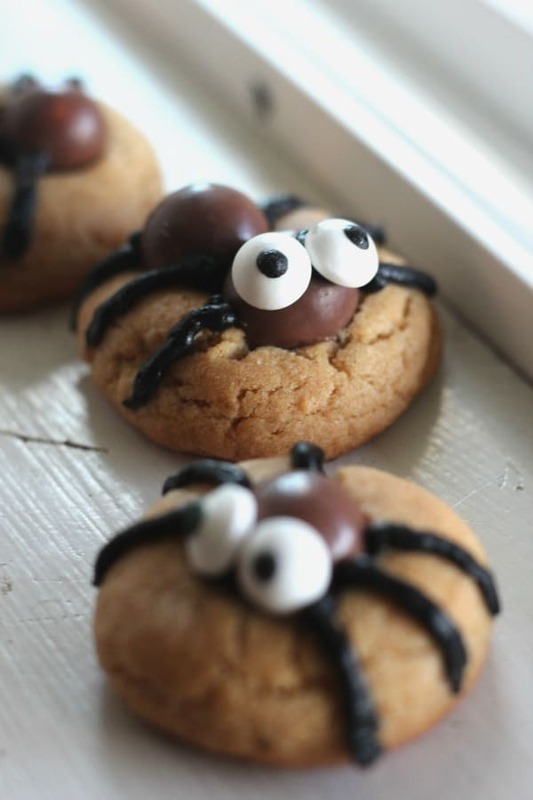 Consider these spider cookies for your next Halloween party. Your kids or grandkids will love them!